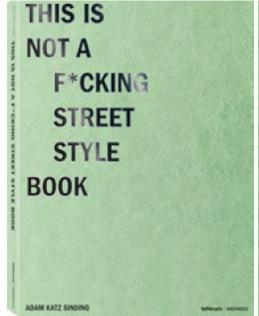 This is Not a Fcking Street Style Book, ISBN: 9783961710782 - available from Nationwide Book Distributors Ltd NZ. This is Not a F*cking Street Style Book is the ﬁrst monograph of cult photographer and inﬂuencer, Adam Katz Sinding (aka Le 21ème), an astute documentarian of major fashion events, top brands, tastemakers, and trendsetters since 2003. For a long time, streetwear was nothing more than the rebel kid brother of high fashion. With his candid, fashion forward-scouting photos, Katz Sinding shows how streetwear has transformed into a leading style reference pioneering trends, championing creativity, and inspiring high fashion designers the world over. Today, the ﬂair of streetwear is as likely to be seen on the runways of Milan, New York, and London as on the streets themselves. This bold fashion book brings together Katz Sinding’s most striking streetwear images, both on the streets and backstage at more than 20 fashion shows around the globe. With his unique backstage access, Katz Sinding captures such top designers, supermodels, and stylists as Kris van Assche (Christian Dior), Lucas Ossendrijver (Lanvin) and Grace Coddington (Vogue), as well as contemporary fashion icons such as Virgil Abloh, Imaan Hammam, and Luka Sabbat. The book also features a fascinating conversational piece on the streetwear phenomenon between Adam Katz Sinding, Virgil Abloh (founder of Off-White), and MENDO.